Its that time of year again! Book Sale! The Dates for the sale are April 8-12. We will set up for the sale on Monday at 10 am. Then the sale will be open from 6-8 pm. The remainder of the week it will be open during regular library hours. Again, pricing is as follows $1.00 for hardcover, DVD’s, etc. with paperback books for .50. Friday will be $1 bag day. If you can help out either with set up or working a couple of hours during the sale, please let me know. We will be providing cookies for book sale guest on Monday evening as well. If a couple of you could bring 2 dozen it would be greatly appreciated. Again, email me and let me know. Thank you for being a part of the Friends of the Library. I look forward to seeing you at the sale. I want to thank everyone who helped set up, work at the book sale, or visited. We had a very good week. Our next meeting will be November 8th at 6:30 pm. This is our bi-annual meeting and is open to all Friends members. 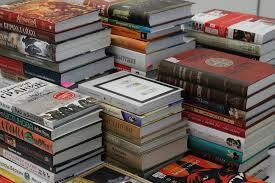 At that time we will have a report on the book sale as well as discuss upcoming library events and projects. We have partnered with Better World Books to resell some of the left over books. Help will be needed to scan and box books for shipment. If you have some extra time to help out during library hours please let me know. It will be an ongoing process for several weeks and you can work at your convenience. I hope to see you on November 8th. 6:00 p.m. – 8:00 p.m. Monday, October 22 then normal library hours through Friday, October 26. Cookies and punch will be served on Monday. All items are $1.00 with the exception of paperbacks they will be .50. Please note: There will no longer be a 1/2 price day and $1.00 bag day has been moved to Friday. Volunteers are needed throughout the sale. We typically staff the sale each evening from 6-8 but if you could work other hours through the week your Friends board as well as Library staff would be very appreciative!! We have also joined with Better World Books to liquidate some of the remaining books after the sale. We will receive 10% back on each book they resale through their online book store. Volunteers may be needed at various times to scan and pack books for shipping. Please remember to renew your memberships during the book sale if you have not already done so in 2018. Thank you for choosing to be a Friend of Liberal Memorial Library. It has been awhile since you have heard from me and I am sorry for that. To be honest there has not been much going on in the “Friends” world. There will be no board meeting this month. Our next meeting will be September 13th. We will discuss the Fall Book Sale at that meeting. I hope to see many of you then. Have a great remainder of the summer.